Published for The British Society for the History of Science. This leading international journal publishes scholarly papers and review articles on all aspects of the history of science. History of science is interpreted widely to include medicine, technology and social studies of science. 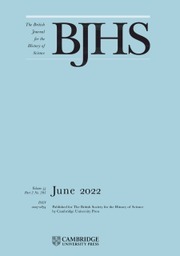 BJHS papers make important and lively contributions to scholarship and the journal has been an essential library resource for more than thirty years. It is also used extensively by historians and scholars in related fields. A substantial book review section is a central feature. There are four issues a year, comprising an annual volume of over 600 pages.